Is Coconut Oil Healthy? – What About Health? Coconut oil is promoted as a source of healthy saturated fat. It’s said to control weight gain, curb sugar cravings, manage type 2 diabetes and is a better cooking oil. That’s a lot of responsibility for coconut oil! 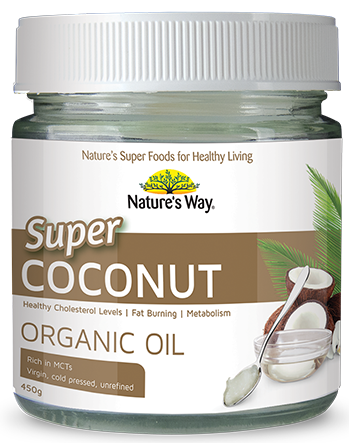 Nature’s Way have joined the super food bandwagon too with their ‘super’ coconut organic oil. Fat burning, boosting metabolism and improving cholesterol levels – coconut oil has it all! But what is it? Coconut oil is extracted from regular or dried coconut flesh. There are variations to the way these are processed. This leads to different types of oil: virgin, crude or hydrogenated coconut oil. 92% of coconut oil is made up of saturated fat – the ‘bad’ fat. A high saturated fat diet is detrimental to our health, increasing our risk of cardiovascular disease. This disease kills more than any other disease with one in six people suffering from it. Using polyunsaturated fat instead of saturated fat reduces your risk of heart disease. If saturated fat increases our risk of heart disease, why is coconut oil considered a superfood? Even the Australian Dietary Guidelines (backed by 55,000 studies) recommend we lower our saturated fat intake. Let’s have a closer look. Majority of fats consumed in our diet are known as triglycerides. Different types of triglycerides are categorised into saturated, monounsaturated and polyunsaturated fats. Triglycerides consist of a glycerol backbone and three fatty acid chains. This is the structure. The coconut oil debate is based on whether lauric acid (making up almost 50% of coconut oil) is a medium chain fatty acid or a long chain fatty acid? This affects how the fatty acid interacts with the body and behaves during metabolism. The medium chains are beneficial because they are absorbed quickly and require less processing than long chains. However, studies show lauric acid behaves more like a long chain than a medium chain. Long chain saturated fatty acids increase cholesterol levels. Lauric acid is falsely promoted as a medium chain fatty acid (one of the lines above) and therefore, coconut oil is promoted as medium chain triglyceride (the whole molecule above). As a result, research on medium chains is extrapolated and applied to coconut oil. This is bad science. Separate studies must show the direct impact of coconut oil in humans. Lauric acid has a negative effect on cholesterol levels. It increases bad cholesterol (LDL) and reduces the effectiveness of the good cholesterol (HDL). Coconut oil doesn’t raise cholesterol as much as butter does, which is good. But coconut oil raises cholesterol much more than vegetable oils do. There are few studies on weight and coconut oil. One study found men reduce their waist circumference slightly when using coconut oil. 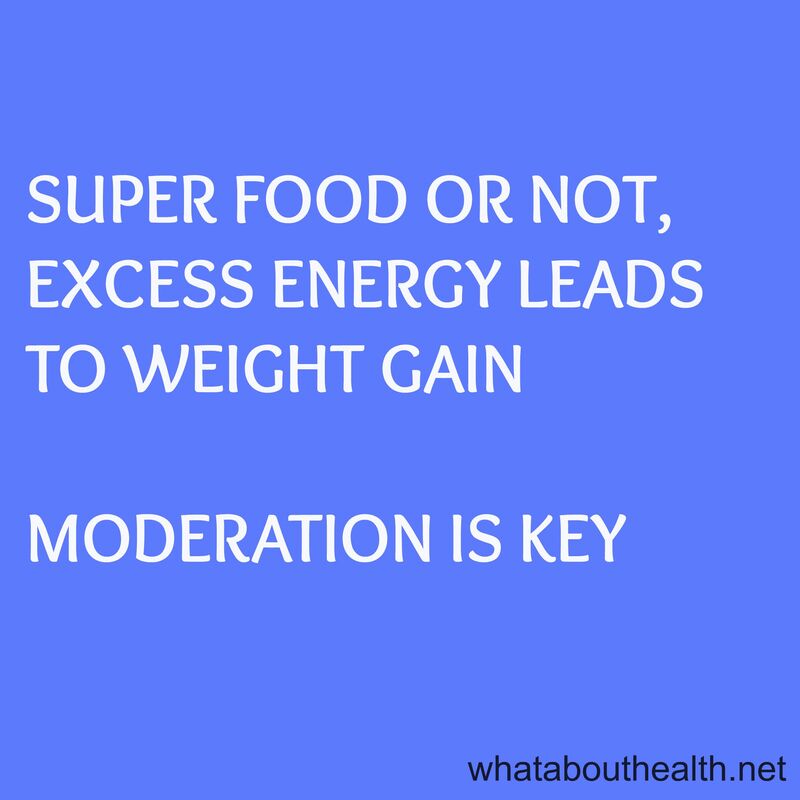 But this occurred when calorie intake was the same – the amount of energy they consumed didn’t change. 7 Ways to Eat More Coconut Oil suggest adding it to coffee, stir fries and even 2 tablespoons to your smoothies. Adding that much provides an extra 978 kJ (245 Calories) to your daily energy intake. The Nutrition Guru compares just how much energy is a tablespoon of coconut oil. Oil has a lot of energy per gram. Excess energy still leads to fat stored in your body. The idea that coconut oil has a high smoke point is a myth. Coconut oil has a smoke point of 177°C, is slightly more stable making it acceptable for single use in shallow frying. However, it is not suitable for prolonged deep frying. It’s often said to be better than olive oil, however, olive oil has a smoke point of 210°C which is acceptable for deep frying. Currently, there is not enough evidence to back up the claims of coconut oil. Testimonies are not reliable and can not act as evidence. Listen to the scientific evidence. The current recommendation is to include monounsaturated and polyunsaturated fats in our diet. These can be found in oils such as olive oil and canola oil but are also in avocado, nuts and fish. We are strongly encouraged to limit saturated fat in our diet. Buying coconut oil for the super food claims is a waste of money. 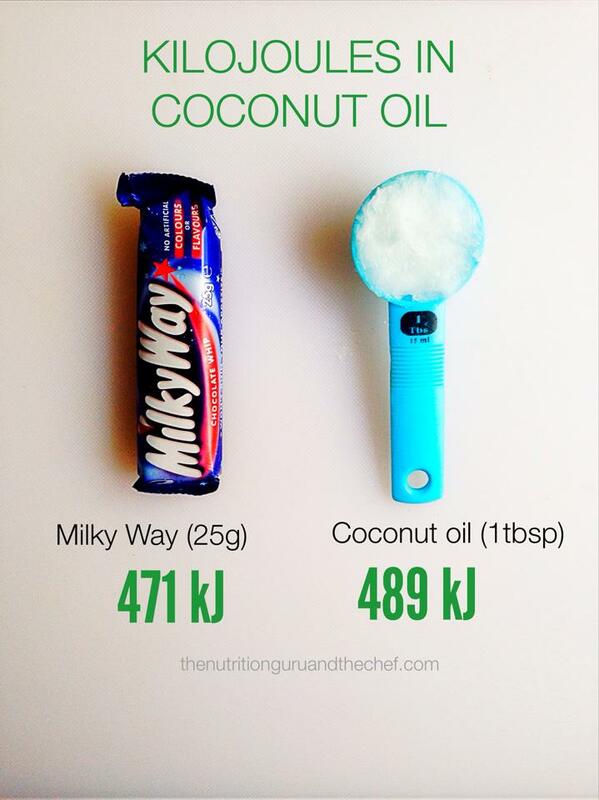 Coconut is like other unhealthy oils, it’s okay to have on the odd occasion but it’s not a super food. Coconut oil is not a healthy oil. But the Healthy Eating Pyramid encourages the use of healthy oils. So choose olive oil! It contains 85% of the good fat – monounsaturated and polyunsaturated. It has a wealth of evidence supporting it’s effect on reducing heart disease risk. Why would you settle for coconut oil when you could use olive oil? What oils do you use when cooking? What do you think of coconut oil? If you found this article helpful, share it with others – so they can know the truth about coconut oil too! Note: A majority of this post was based on the Heart Foundation’s Evidence Review: Coconut Oil and Heart Health, however this post was not endorsed by the Heart Foundation. Pingback: Celebrating a Year of What About Health? – What About Health? Pingback: The sneaky way to add fibre: LSA | What About Health?